The diagram shows the part of the curve y = sin2 x for . ii. Hence find the x-coordinates of the points on the curve at which the gradient of the curve is 0.5.
iii. By expressing sin2 x in terms of cos 2x, find the area of the region bounded by the curve and the x-axis between 0 and π. We are required to find the x-coordinate of the point on the curve where gradient is 0.5. 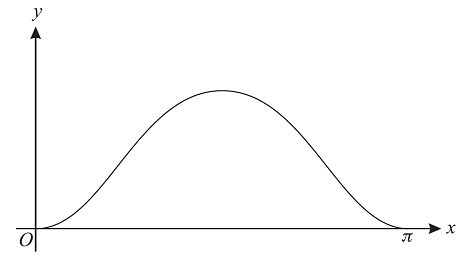 Therefore, we can equate expression of gradient of the curve with 0.5. We do not need to find any solutions beyond the desired range . We are required to find the area of the region bounded by the curve and the x-axis between 0 and π.